Bond – A delicate armchair which is equally convincing as a single chair, in a group or as a complementary element to a sofa set. The bond cantilever chair tilts on its own axis on a four star base of high gloss chrome. With its rotational polished metal rails and smoothly flat upholstery, this chair introduces a dynamic elegance into the living room. It proves that less sometimes is more and can also be extremely comfortable. The Bond chair‘s comfort levels are further enhanced by the manually adjustable head rest and by using the complementary stool as a convenient foot rest. Flat steel on a central column with a shiny chrome plated star base. Creative and intelligent: ipDesign seating furniture. Whether modern or classical - ipDesign creates seating furniture with high requirements for function, design and comfort. The comfortable upholstered furniture, like the sofa bed campus or the chairs Pax and Rocky, invite you to sit, lie down and relax. 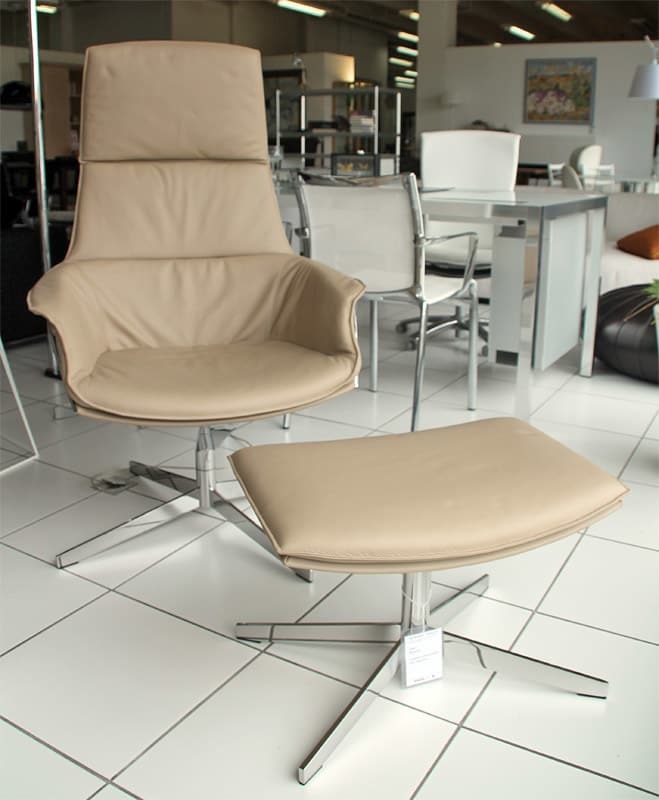 Covered with fine leather, sitting on a ipdesign furniture will be a special experience for a relaxing treat. Do you have a question about "Bond"? How can we contact you?